Expert advice to help you feel better. The shoulder is a very complex joint. It’s called a “ball in socket”, but truthfully it functions more similarly to a “ball on a wall”. You have the round ball of the humerus (arm bone) held on to the flat surface of the scapula (shoulder blade) by 4 muscles that essentially create a sling to support the shoulder. When a person moves his/her arm to 30° those muscles engage squishing the ball to the wall. The deltoid muscle then does the bulk of the movement to perform many activities such as pushing, pulling and throwing. 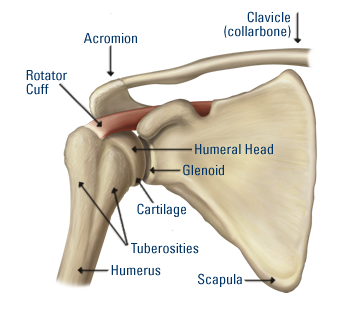 How is shoulder tendonitis treated. 1. Decrease the activity that is causing the pain. If an overhead athlete is doing a lot of throwing it is time to make some adjustments to the throwing motion or to the amount of time the thrower is doing. Same for gardening, weight lifting, gymnastics, painting, or any other repetitive activity with the shoulder. 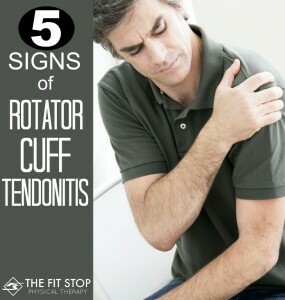 2.Rest is critical, but not so much that you shoulder becomes stiff in addition to painful. Foing the proper movements that will help restore the motion and decrease inflammation. 3. Anti-inflammatory medication such as NSAIDs and (in more extreme cases) steroid injections are used to decrease inflammation of the joint complex. 4. Physical Therapy -Your physical therapist is a specialist in identifying areas that are weak or otherwise limited and can be contributing to your pain. They will then educate you on proper exercises/activities to keep these structures health, functional, and pain-free. The therapist will progress the patient into active strengthening exercises. The key component of these strengthening activities are to perform them in an appropriate range. Your therapist will be able to recommend how far you go and how much you push when performing your exercises. That way you get the motion/strength you need, but not at the sake of injuring your shoulder. 5. Ice is helpful as it decreases inflammation externally for a period of 15 to 20 minutes. It is good to use ice following a session of activity. Shoulders are a difficult joint to rehabilitate when tendonitis has set in. The stress that overhead athletes and every day workers put on makes it difficult to give the appropriate rest to decrease the inflammatory response in the joint complex. With rest and proper range of motion and strength exercises, shoulder pain can decrease dramatically. Need more information? Would you like to talk to one of our therapists about your shoulder pain? Please click on the links below to set up your next appointment! Looking for more help with your shoulder pain? What is Home Care Physical Therapy? Is Physical Therapy Covered By Health Insurance? Have a question? Need an appointment? Contact us! The information presented on this blog is designed to be used for informational purposes only. The diagnoses and treatment plans outlined are extremely generalized and may or may not be the recommended interventions for your specific problem. If you are experiencing pain, you are encouraged to consult a healthcare provider to determine the best treatment plan that will be in your individual best interest. Fit Stop Physical Therapy claims exemption from accident, injury, or perpetuation of any injury incurred while performing exercises found on this website. The user assumes all risk… and reward!! Your wellness is our first priority. We pride ourselves on providing you with the tools, knowledge, and experience to achieve your full rehab potential.